I’ve been going through my photo archives and pulling a few notable images, and this is one of my favorites. I don’t remember exactly how I got this card, it must have been when I was on vacation in Okoboji when I was a kid. I have a small collection of local weather-disaster photos but this is the best image I have, even if it is in a terrible state of preservation. 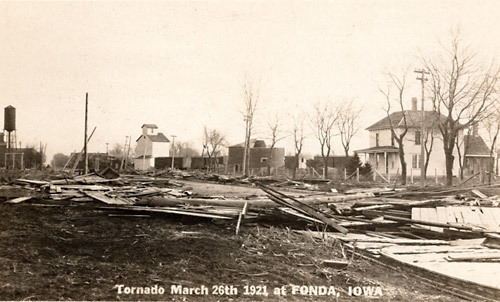 As far as I can determine, this is the first image ever captured of a tornado. Up to this time, film was not fast enough to capture a moving tornado, even after the invention of fast film, it took a while for a lucky photographer to be in the right place with their bulky view camera equipment. 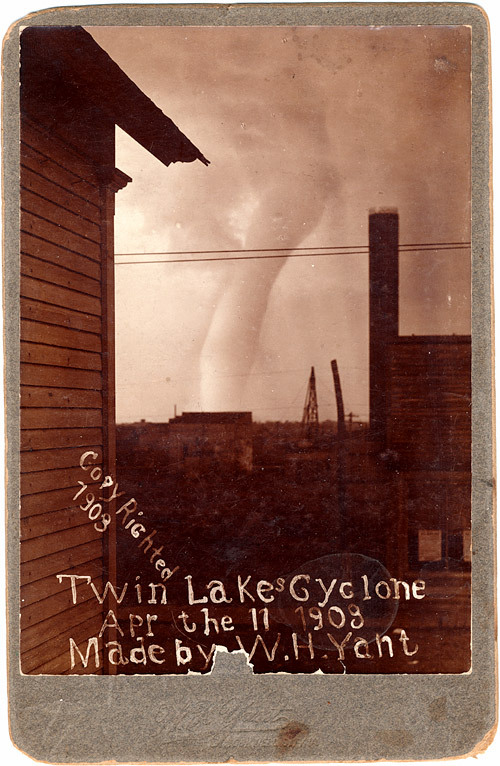 Even back to the early days of photography, there were stormchasers that mass-produced prints. Usually they came in the aftermath of the tornado and took photos of the devastated area, and sold stacks of prints to the locals as mementos.